Julie Bindel, an original signer of the Stop Surrogacy Now statement who is a journalist, author, and human rights campaigner, traveled from her home in London to California’s San Francisco Bay Area in order to work with The Center for Bioethics and Culture (CBC), an organizational signer of the statement. Julie joined CBC Founder & President Jennifer Lahl for An Open Conversation on Surrogacy at the CBC offices on Friday, November 11. The conversation was broadcast live on Facebook, and the recording is now available to view via both Facebook and YouTube (see below). Please watch and share this important conversation! While in the San Francisco Bay Area, Julie was also interviewed on the Michell Meow radio program. 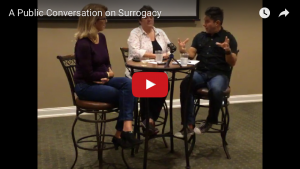 They had a lively discussion of surrogacy, and you can listen here.